Are you looking for a luxury Yorkshire holiday? 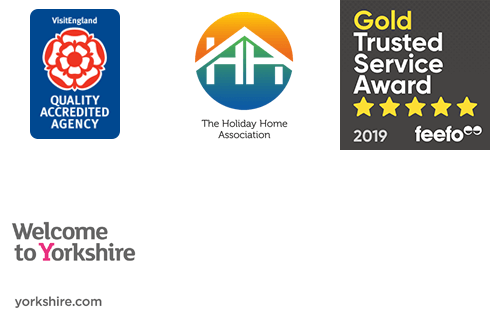 We have a great selection of stunning holiday homes which have achieved 5 star and 4 star gold awards in an assessment of their quality. These properties all have that extra ‘something’ to make your stay that bit more special. All of our Yorkshire properties have been carefully graded by accedited assessors and given a star rating based on a strict criteria. It is always worth speaking to a member of the team to discuss anything that you particularly want from a property. Sometimes that “something extra” that a luxury property brings can be that there is ample parking, that the property is large and spacious, or that it has a large garden or grounds. These properties sometimes have tennis courts, hot tubs, or extra rooms for entertaining. Whether you are after a small property for a couple of people or a large property for a family or group of friends we are confident that we will have a luxury Yorkshire holiday property to suit the size of your party. We have big bold properties with contemporary décor and traditional properties which have been maintained to a high standard it’s easy to find a luxury holiday in Yorkshire to suit your tastes. We have a range of beautiful luxury Yorkshire holiday properties available. Please look below to see the latest availability of call us on 01947 600700 to start discussing your luxury getaway in Yorkshire. A luxury property boasting a sunken hot tub in the enchanted garden. Located close to the pubs, shops and tea rooms in Kirkby Malzeard close to Masham in the Yorkshrie Dales.